In the ‘90s, Joe Pine and Jim Gilmore described what they saw around them and wrote, The Experience Economy. They did not invent the Experience Economy; they simply provided a lens for the rest of us to use to see it and a language for it to be discussed. 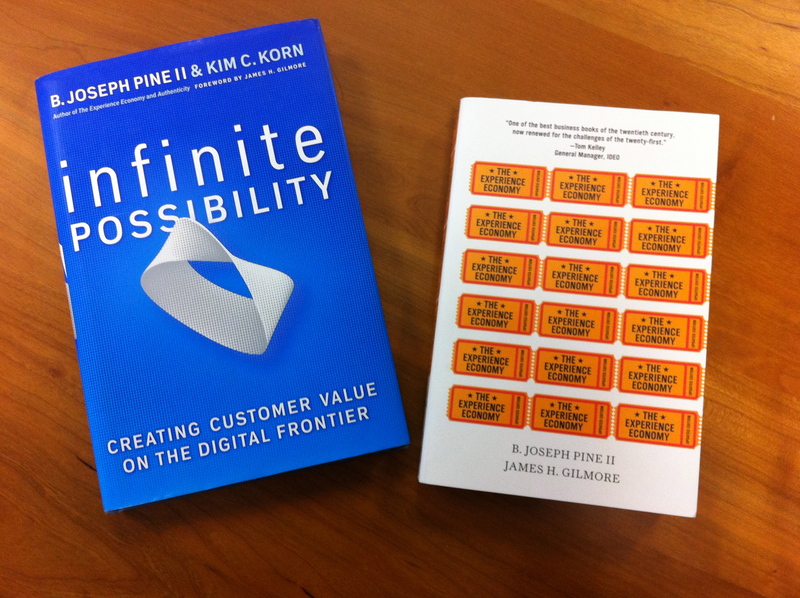 Earlier this year, Joe Pine and Kim Korn described what they saw around them and wrote, Infinite Possibility: creating customer value on the digital frontier. They (including Jim Gilmore who wrote the intro) did not invent the digital frontier; they simply provided us with a lens to see it and a language for it to be discussed. They would deny that they have provided a “map.” They would say they have provided a framework. In either case, it is a gift. We are in what many are calling a mass migration to the virtual world. For most of us, our ticket to the virtual world is the phone. As more and more of us migrate to smartphones, we cross over. As businesses, we stand on the shore watching this migration and wondering what to do. Most of us offer products and services that are very much in the “real world.” Most of us recognize that our brands are virtual … and then the brain freezes. Joe and Kim are like the guy you are lucky enough to sit next to on your first flight to New York City. They explain how the streets are laid out and how the mass transit system works. They don’t predict; they describe. They start with explaining the two worlds: Real and Virtual. There are 4 realms within each of these for a total of 8. Each realm differs in terms of time, space, and matter. Sound confusing? Like exploring New York City for the first time, go slow. Read the Introduction and Chapter 1, and then watch one of the many YouTube presentations by Joe Pine. Read another chapter; watch another video. Mixing the real and the virtual will also be a fitting way to experience the book. Do you have a digital framework to guide you?